During my very first visit to the US (during my honeymoon, to be precise) I had my very first, very embarrassing experience with a plunger. After all, it happened at my mother-in-law’s house. As it happened again at a hotel in Las Vegas a few years later, I still didn’t understand why I clog a toilet in the US, but never have before in Germany. I moved to the US many years later and bought an older home. As the drought in Georgia worsened in 2007, I noticed that the toilets in our home used 3.5 gallons for each flush. I started looking around in home improvement stores and was stunned that all toilets available used 1.6 gallons for each flush. As toilets with the option of using very little water for flushing No. 1 have been available in Germany for a very long time, I could not believe I couldn’t find them here. 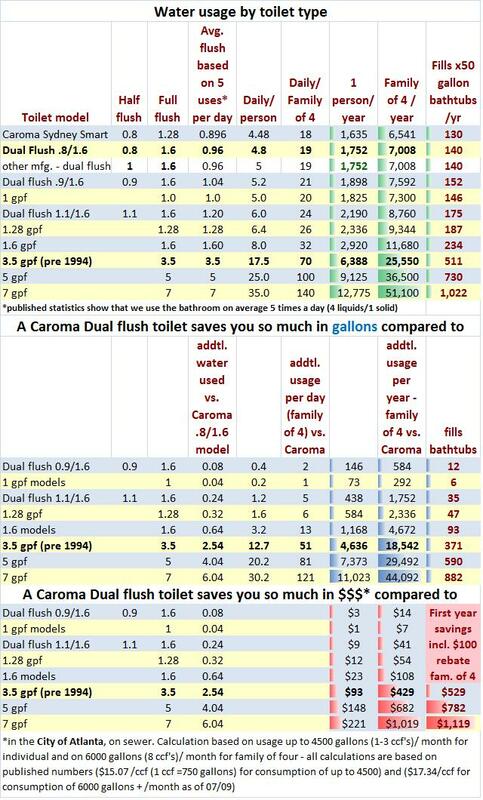 So after much research, I finally found Caroma Dual Flush toilets and decided to spread the word and help Georgians flushing less water and money down the toilet. After I learned why Caroma toilets work so well with very little water, I realized why American toilets clog. So finally, 16 years later I realized that there was nothing wrong with me, or my diet, that I clogged a toilet on my honeymoon! Although most of the time this flushing method gets rid of the waste efficiently, there is a tendency for blockages to occur in the toilet trap way. Australian and European designed toilets use a wash down method which “pushes” the waste down, instead of “pulling” it. This is why European toilets have a larger diameter trap way which results in less clogging. One drawback of wash down toilets is the smaller water spot in the bowl, which can result in “skid marks” happening on occasion. So it really comes down to a matter of personal preference. If you are comfortable with getting out a plunger to unclog your toilet every now and again, then stick with an American style toilet. If you have issues with clogged toilets and don’t mind using a toilet brush every now and then an Australian or European style model may work better for you. Conserving water in our semi-arid region is vitally important to us all. Taking a few small actions to use water efficiently inside and out can make a big difference. All toilets are not created equally — some are thrifty while others are water-guzzlers. All toilets are not created equally — some are thrifty while others are water-guzzlers. Pre-1994 toilets use 3.5 to 7 gallons per flush (gpf). Since toilets can last 25 years or more, many high water-using models are still in use. To help get those toilets out of service, Fort Collins Utilities is offering a rebate of up to $50 to install high-efficiency toilets. Rebates are available for Utilities residential water customers who purchase qualified WaterSense labeled toilets that use 1.28 gpf or less. WaterSense products are certified by an independent laboratory to meet rigorous criteria for performance. You’ll receive a $35 rebate for the purchase of a qualifying toilet and an additional $15 for recycling your old one. For more information on these rebates and other programs, visit fcgov.com/ FortCollinsConserves, e-mail ldaudney@fcgov.com, call (970) 221-6877 (970) 221-6877 or TDD (970) 224-6003 (970) 224-6003.
via The Origins of the Toilet. Why do some people call a toilet a John? According to countless resources the reason some people have tagged a toilet with the name John is simply because the first recorded inventor of flush toilet is John Harrington. John Harrington was a descendant of Queen Elizabeth the first. What are the origins of the word toilet? The french were the first to use the word toilet almost three centuries ago. The word like countless other words is Latin. The word derives from tela or plural tele which means cloth. French barbershops used the word toilette to describe the grooming activities typically associated with the barber shop. In the US the word later evolved into the device which we use to flush our waste in the bathroom. However it is not uncommon in Europe to hear the word toilet being associated with what we know as the bathroom as a whole. What is a commode? Why is a commode associated with the word toilet? Well commode a few centuries ago in France just meant a cabinet that is close to the ground or a chest with drawers. During the Victorian Era commode took on a whole new definition. The people of the Victorian Era had bedside cabinets that enclosed a chamber pot or in other words pot that was used for the basic needs of a toilet. Except of course it did not flush. Why do some people call a water closet a toilet? It is common to see the word water closet used on blueprints for homes. In this context it typically means a standard toilet. The word water closet simply means, “room with a toilet.” Water closets were originally separate from the bath room. Bath room originally meant a room with a bath in it. The first public water closet was a pay per use toilet. The customers were charged one penny to enjoy the luxury of a flushing toilet. This is where the motto “to spend a penny” came from. The origins of the word loo are not exactly known. However it is believed to come from the french. In the early days before flush toilets and indoor plumbing the French would dump their waste out the window, exclaiming, “Gardez l’eau”. This meant look out for water. The word l’eau sounds like the word loo. Why do some people call a toilet, “a head”? The word head is commonly used on boats. It is called a head because it was placed at the front of a boat. The front of the boat is where the most splashing from the seas occurs. This would allow the head or toilet to receive a well needed cleansing or flush. Where does the term lavatory come from? Lavatory, has it beginnings in Latin from the word lavare meaning wash. If you speak Spanish you know that lavarese means to wash. The word lavare evolved over time to mean lavatory which some consider a proper way to say bathroom. Bathroom which is commonly know to enclose a toilet as well a place where you can wash.
bathroom toilets can be a drain on your finances. A dual flush toilet saves a great deal of water resulting in a significant cost decrease in you water bill . Next time you buy a toilet, choose a water saving one. Dual Flush toilets mandatory in Ireland – the way to “go”! THE STANDARD toilet is about to be flushed out as part of a new Government water conservation measure. Environment Minister John Gormley has signed off on new building regulations that will lead to a ban on traditional toilets. The Government says that the move will lead to hundreds of millions of gallons drinking water being saved each year. Under the new regulations, all toilets fitted into homes will be required to have a dual-flush system. In addition, dual-flush toilets will be the only models available at DIY stores, plumbing supplies stores and hardware shops. The regulations will be implemented from November. Yesterday, Mr Gormley said that making dual flush toilets mandatory would lead to greater efficiencies in the use of water, and was a sensible and practical step that formed part of the National Water Conservation Programme. Official estimates suggest that as much of a third of the country’s drinking water is used to flush toilets, which the Government considers poor use of a valuable resource. Standard toilets in Irish homes and workplaces flush between six and nine litres. Dual flush toilets release four litres in water-saving mode, and six litres for a full flush. “It demonstrates how simple but practical ways can be found to conserve water,” said Mr Gormley, adding that further water conservation measures would be introduced. These are unlikely to include any attempt to introduce water charges or metering, issues that have proved politically divisive in the past. If you are interested in finding out more about Dual Flush toilets, visit www.caromausa.com. Caroma, an Australian company has invented the Dual Flush system in the 80’s and has a 90% market share in Australia. With a fully glazed 4″ trapway, blockages are virtually eliminated.